Magnus Hellberg‘s name was nonexistent prior to the 2010-11 season. He was skipped over in his draft year (2009), along with the following year (2010). After being skipped two years running, Hellberg made sure his name would be called in 2011. His name was left off Central Scoutings Midterm Rankings, but by January of 2011, Magnus Hellberg quickly burst onto the scene in Almtuna (SWE-2) posting the best goals-against-average and save percentage of any goalie in Sweden. Scouts came out of the woodwork to see what this mammoth goalie could do between the pipes. Hellberg finished the season with a 2.04 GAA and a .936 SV PCT. Tag on an additional five shutouts, and the question now became not whether Magnus would get picked, but when. Magnus and his agent took the 12-hour flight from Sweden to Minnesota. He arrived in Minneapolis a few days before the draft to experience the city and meet with a few teams who were eagerly waiting to talk to him. He was kind enough to meet with me the night before the draft. We struck up a conversation that turned into a two-hour question-and-answer session about everything from his career, his diet, what life was like in Sweden, and his expectations of the draft, among other things. Magnus also wanted to know what it was like to live in America. He asked me questions like: How are the people? What is there to do? Where and what do you shop for? Are the women as attractive as they are in Sweden? I immediately answered no to the last question – and that is no slight to American girls. But the next day was the draft (a day Magnus had been waiting for quite some time). That Friday night came and went with no team calling Hellberg’s name in the first round. However, after speaking with him the night before, I knew Magnus wasn’t too worried about it. Hellberg knew he was good enough to get selected in the 2nd round. So the following day, the 2nd round of the NHL draft started bright and early. Magnus didn’t have to wait long at all to hear his name over the PA system. With the 38th overall pick, the Nashville Predators snagged the 6’5″ behemoth, much to the chagrin of Devils fans (oh what a match made in heaven that would’ve been). With a quick handshake and hug from his agent, Magnus walked down the steps, grinning from ear to ear, ready to accept his jersey. After meeting with the head honchos of the Nashville brass, Hellberg was taken to conduct interviews. Finally, he could breathe a sigh of relief knowing that his hard work had paid off. Since that day, Magnus attended the Nashville Predators rookie camp (and needed to use Rinne’s and Lindback’s pads), practiced with the Frolunda Indians, got into a bit of an incident involving a Finnish fan and a puck, played against the New York Rangers and fellow Swedish/Frolunda goalie star, Henrik Lundqvist, started a few games and posted a shutout. So getting the chance to interview Magnus – for a second time – was a great opportunity. Shawn Reznik: Describe yourself as a goalie in a few short sentences (style, technique, strengths, and weaknesses) and who do you compare yourself to and why? Magnus Hellberg: I would describe myself as a big goalie who plays the butterfly style. I try to take advantage of my size and try to work with as small movements as possible. I try to stay positioned to the puck all the time and try to read where the puck is going to be before they make a play. I would compare myself to Jonas Hiller, Henrik Lundqvist, Anders Lindbäck etc. They play tight in the net and that’s how I want to play my game, too. SR: As a goalie, what do you think about the style of game between European and North American hockey? And which fits your game better? MH: I like both styles but there is a lot of differens between them. European has bigger rinks and they get more time to do things. In American style hockey it goes a lot faster and they have more shooting opportunities. SR: At the draft in Minnesota, did you get any one-on-one interviews with any teams? If so, which ones? MH: Yes I did! I talked to Chicago, Nashville and Columbus. SR: Which team seemed the most interested in you before you got selected? MH: Really hard to say, you don’t really know until you hear your name at the draft. SR: Is it special to you that you were the first goalie selected in the 2011 NHL Draft? MH: Yes of course. That’s something I could only dream of. It doesn’t really matter what round you get drafted, it’s what you do afterwards that counts. I feel honored and it’s something I will never forget. SR: Because you are older than most draft eligible goalies does you feel you have a more mature and NHL ready game? MH: I think you have to look at the individuals. Some people develop faster. If I look at myself I need to get a lot stronger, and that’s something I work on every day. I have to learn to play and adjust to the small rinks and the style of game in America. But I feel that I’m not that far away and that’s something I notice when we played against the Rangers. SR: With the Preds having so much goalie depth in their system already (Rinne,Lindback,Engren,Pickard,Smith) are you concerned about your opportunity to get to the NHL? MH: No I wouldn’t say that. They are all great goalies and I’m really looking forward to compete with them. I can just focus on doing my best every day and show the Nashville organization that I want to play in the NHL one day. SR: Are there any downsides of being a big goalie? MH: Hard to say, maybe it takes a little bit more time to get down and cover the five hole (between the legs) and some say big goalies aren’t that flexible as small goalies are. But I guess it depends on what you train on. SR: How long do you plan to stay in Sweden? MH: It’s really hard to say. I haven’t thought about that yet. I take one season at a time and my focus now are on my current team Frolunda. 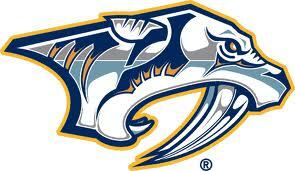 But I had a good chat with Nashville and they are following my development so we´ll see what they think is best for me. SR: Why did you choose Frolunda? MH: I chose Frolunda because they were professional right from the start. They made it clear that they believe in me and I think Frolunda is the best place for me to develop. Their facilities are amazing and give you all the tools you need to get better so you can’t complain on that part. My goalie coach, Micce Andreason, who I worked with in Almtuna (my last team), also came along to Frolunda so to continue working with him means a lot to me. The city Gothenburg is really beautiful, too. It just felt right from the start. SR: What are your expectations as a goalie in Frolunda this season? MH: To grow as a goalie and to make myself a name in the SEL. I learn new things every day and I want to get better and develop as a goalie and person. Of course I want to play games, that’s when you develop the most. SR: What do you think of your competitor, Frederik Andersen? MH: He’s a really great guy and a great goalie. He plays the same style that I play, he’s calm and try to take advantage of his size. It’s very good competition between us and that’s good for both of us. SR: How do you think you performed at Nashville’s development camp? MH: Okay under the circumstances that I didn’t have my own gear and hadn’t been on ice for two months. But it was a great experience and a lot of fun to meet everybody at the camp from prospects to the organization and to see what the facilities and the city were like. SR: What did you learn from it? MH: I learned a lot. Everything from diet and how they want you to act and what they expect from you. 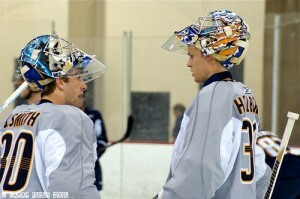 SR: What was the adjustment like participating in prospect camp wearing Rinne and Lindback’s gear? Did you appreciate that of all the goalies in camp, you were the only one that would have fit the gear of the two NHL level goalies? MH: (Laughing) I just wanted to go on the ice with the other guys and play some hockey. SR: What were your impressions of Nashville? Both in terms of the organization and the city? Did you get a chance to check out any of the music scene while he was here? MH: I have just good things to say about Nashville: the city is great! The organization is very nice and everybody is really friendly. The fans seems really great too, so I’m looking forward to next time I’m in Nashville. We didn’t have any time to check out the music scene while we were there. It was a lot of training and when you had some spare time, you just wanted to relax and recharge your batteries. I was lucky to still be in Nashville during 4th of July because I met Mitch Corn the day before that. It was awesome with all the fireworks, people and to seeing Darius Rucker do his thing. I like country music so that was a great day. SR: How far do you think you are from playing in the NHL? MH: Again, hard question. Don’t really know since I haven’t been playing in AHL where it’s easier to see how far you are from the NHL. But I know I have to work on my physique, but it was a good experience to play against the Rangers and measure yourself against NHL players. That game I didn’t feel that I’m that far away. You wont get anything for free and I have to work my hardest everyday and when the day comes I will be ready. SR: What was it like to meet Henrik Lundqvist? What was your meeting like? MH: It was really exciting, he’s a really great guy. He is an idol I’ve had since I was a kid. He wished the best of luck this year and to play against him was magic. He is one of the best goalies in the world. Hellberg’s journey to the NHL will be a tough one, especially if Frederik Andersen has anything to say about it. Although Hellberg has posted tremendous numbers in the few games he has played, Andersen has one-upped him in almost every game as the hottest goalie in the SEL right now, powering the Indians to first place. He currently holds a 1.32 GAA and a .953 SV PCT in 15 games this season. Add in that Nashville has a laundry list of top goalie prospects in their system, and Hellberg has a few stumbling blocks to cross before he even sniffs a second of playing time in the NHL. But Hellberg has been here before. It may not have been on such a pronounced level, however at one point Magnus was passed by twice at the draft, and came back on top. If he could come out of nowhere to be a top draft pick, why can’t he win back the starting job in Frolunda and eventually secure a roster spot in the Predators lineup? The short answer is: he can – and he will.